This picture is a bit of a departure for me since I don’t normally post images like this. It’s kind of a bokeh explosion with almost no clear focal point except for the one seed in the center (another thing I don’t do very often, incidentally) but I’m posting it here for a couple of reasons. You might have remembered a few posts in which I cautioned against shooting prime lenses wide open unless you really needed that crazy depth of field or light-gathering ability. Most lenses aren’t the sharpest when wide open, and the depth of field is often so shallow it’s downright unmanageable. Unfortunately, my trusty little (or giant, when you put it next to almost any modern camera) D200 is not the performer it once was and has this nasty habit of not stopping down the lens aperture on about one in five pictures. This means on any given photo session where I’m shooting with an aperture smaller than f/1.8 I’ll have several photos that are fine and then one that is completely washed out because the lens blades did not close properly. To combat this problem I’ve started thinking of my lens as not just limited in focal length, but limited in aperture as well. By shooting at only f/1.8 I have had to consider things that would not normally be an issue, since I could just control depth of field or incoming light by stopping down my aperture a bit. It’s kind of ironic since I normally preach against using the widest possible aperture and yet, in some ways it’s what I’m stuck with. This photo, then, is a result of such conditions. It’s a sprig of seeds on a Chinese Pistache tree caught in the afternoon sunlight, and what you see here is almost exactly what I set out to capture: one single seed in focus with the rest of the image a red and white tapestry of beautiful bokeh. In some ways I wish I could have made the foremost seed a little more accentuated since it’s kind of difficult to notice at first glance, but when dealing with non-macro lenses results like this are about as good as one can reasonably expect. Beautiful verse to put with it. And not premature at all, since it is Advent, after all! May we all truly hearken unto Him! Yes, I have had those issues with my 50 mm too! Thanks for the reminder! Still really enjoyed the colors! Really? You have the same problem? Now that’s interesting. I figured it was just something weird about my camera and lens, but in a way it’s nice to know others have similar issues. Have you found anything that solved it? Enjoyed looking at this week’s photo. Normally, you don’t open your aperture to 1.8 or 1.4 for your photos. 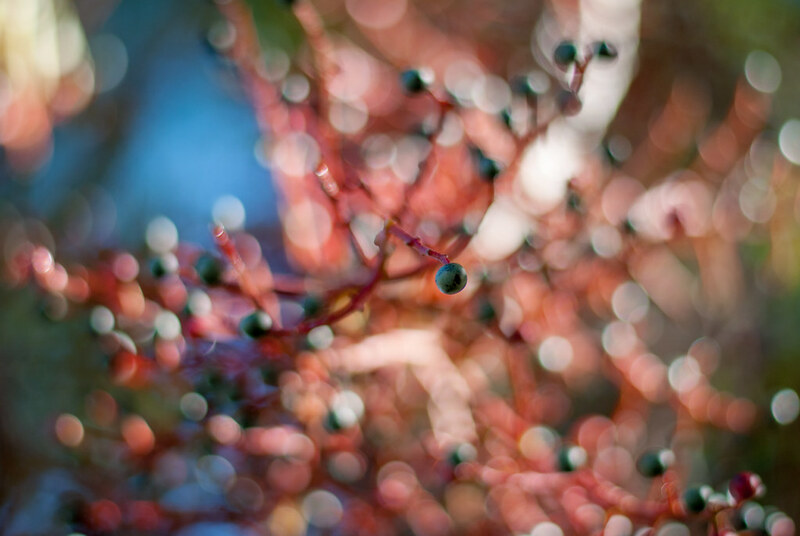 In fact, I have been learning from you that quite a bit of bokeh can be achieved by using f2.8. Now you shoot at f1.8! Other than that single seed, everything else is totally out of focus. The splash of light and color surrounding that seed is intriguing. Hmmm… would that not suggest that we be aware that, at wide apertures, our depth of field is very limited? Maybe one of the reasons we are told to focus on the subject’s eye? I will make it a point this weekend to work with my D7100 and my prime lenses set at f1.8 and f1.4. Finally, nice verse from Deuteronomy. Christ is risen! Great photo, and perfect verse to set the tone for the holidays! Thanks for sharing with us! I’m glad to hear that you spent some time (25 shots) playing with it. I hate to think anyone is happy with a single click. The side lighting (even in the bokeh) creates a very dynamic out-of-focus area.